As a child, I knew just what Count Dracula looked like. He was a clean-shaven, stern, arguably handsome European man with a penchant for tuxedos and capes. If he opened his mouth wide, he’d reveal his incisor fangs. I’d seen photos and caught snippets of Bela Lugosi and Christopher Lee playing Dracula. 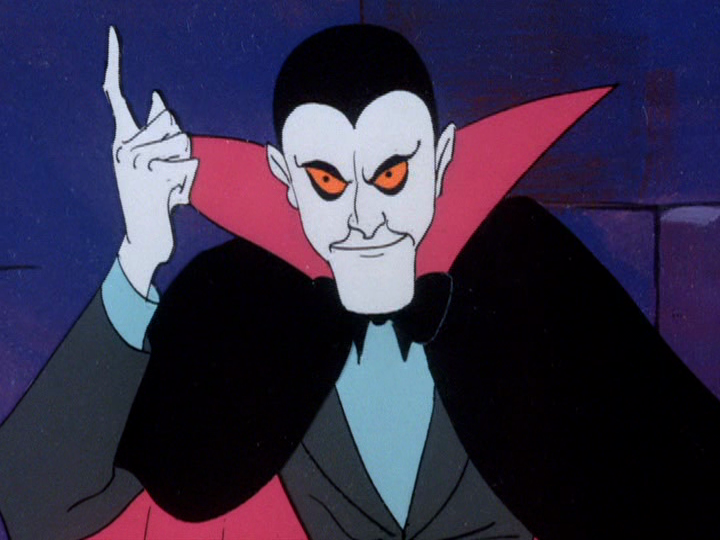 The good count had appeared in numerous cartoons I’d seen as a child. I particularly remember his appearance with Frankenstein’s monster and the Wolfman in Scooby-Doo. In 1979, I watched one of my first R-rated movies. It was Dracula, starring Frank Langella and Sir Laurence Olivier. In those days, I was more interested in Star Wars (1977) than vampires and I can’t honestly say the movie impressed me. Langella was another stern-faced man in a cape. The only notable difference I found from other Draculas was the big hair, which would become the hallmark of the 1980s. As I moved into high school and college, I took several German classes. 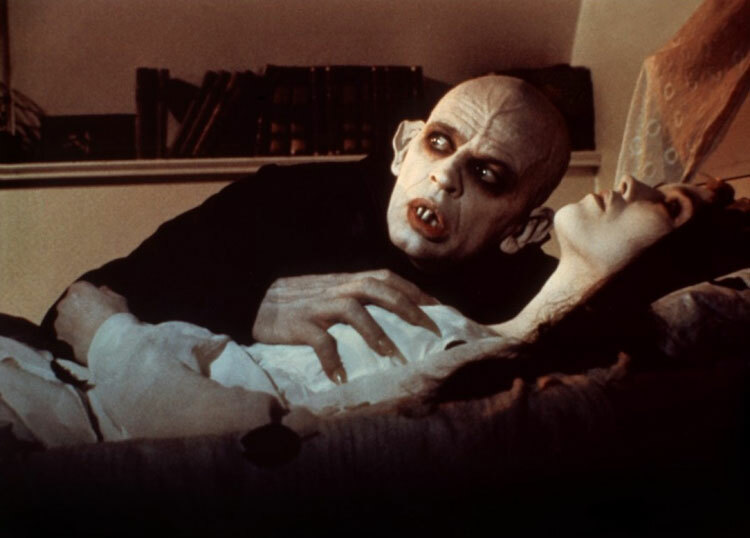 In the summer of 1984, during one of those classes, I saw a film that would change my perception of the vampire forever—Werner Herzog’s 1979 movie, Nosferatu: Phantom der Nacht. Klaus Kinski’s Count Dracula was not handsome by any stretch of the imagination. He was bald, with enormous bat-wing like ears. A pair or rat-like fangs dangled from his mouth and his fingernails looked as though they could rip someone to shreds. Despite all this, Kinski’s Dracula possessed a certain charisma. I found it difficult to look away and, monstrous as he appeared, he came across as a tragic figure doomed to his life of eternity. I searched for my own copy of the movie for some time after that. Unfortunately, the movie wouldn’t be widely available in the United States for some time. My search did lead me to the classic 1922 Nosferatu. If anything Max Schreck’s Dracula or Orlock—depending on the version you have—was even more terrifying than Kinski’s. He seemed less sad and more a monster. 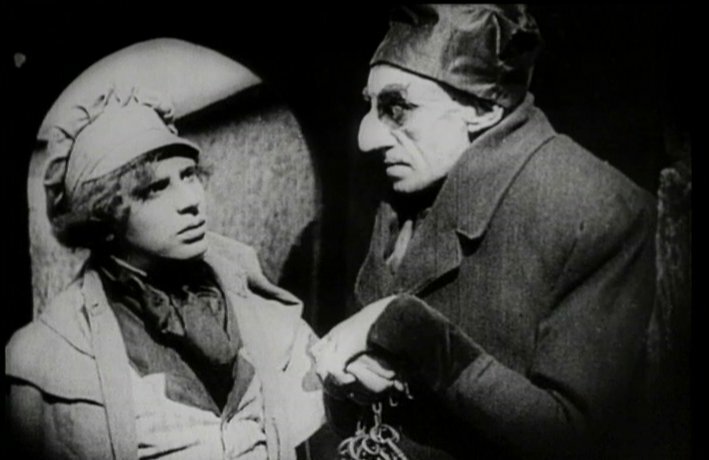 Gustav von Wagenheim’s Hutter appeared to go from silent film overacting to genuine terror when he shared the screen with Schreck. Although the cinematic depictions of Dracula clearly took some inspiration from this description, none of them caught it entirely. At that point, I had yet to see Dracula with a mustache or a profusion of hair! I would come to realize, Stoker’s description was inspired by Vlad III, Prince of Wallachia. 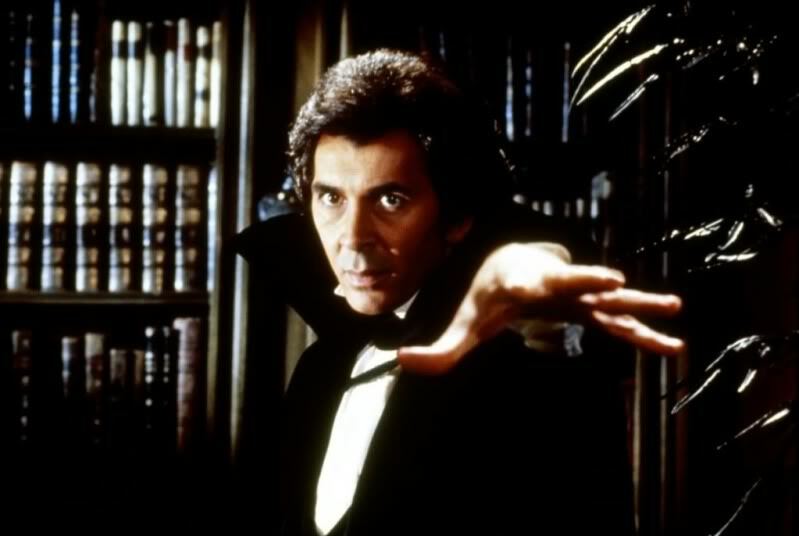 My interest in cinematic and literary vampires has continued to grow since that time as has my appreciation for the performances of Lugosi, Lee and Langella. What’s more, I’ve discovered the three faces of Dracula over and over again. In Stephen King’s ‘Salem’s Lot, we meet Kurt Barlow. According to StephenKing.com, King’s inspiration for the novel came by wondering what it would be like if Dracula should appear in twentieth century America. 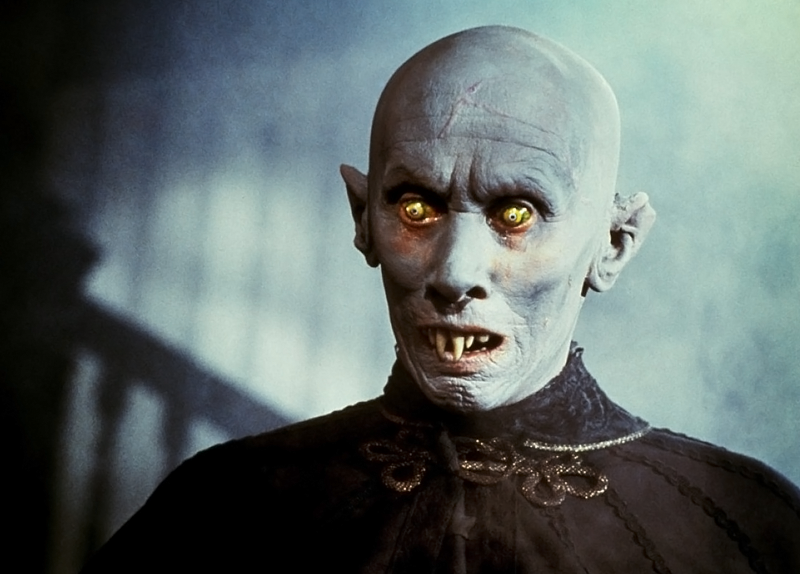 In the 1979 miniseries, Barlow clearly resembles Max Schreck from Nosferatu. Chelsea Quinn Yarbro dedicated Hôtel Transylvania (1978), the first novel featuring her heroic, handsome and aristocratic vampire Saint-Germain, to Christopher Lee. In a panel at the 2004 World Fantasy Convention, Yarbro said she wanted to capture the eroticism and appeal of Lee’s portrayal in her own vampire. In 2005, Anna Kosktova literally imagined Vlad III as a vampire living to modern times in her novel The Historian. Kim Newman’s Anno Dracula (1992) also imagines Vlad III as a vampire living outside his time. As a writer, I am intrigued by each of these three faces of Dracula and how they can be applied to vampire characters. An appealing, charismatic vampire clearly has the advantage moving among human populations and attracting those he wishes to feed upon. However, if a vampire is a reanimated corpse, one could reasonably expect him to be a frightening creature who must rely on wits and strength to obtain his prey. Of course, the historical Vlad is a compelling figure, monstrous in the way he is said to have dealt with his enemies, yet seen as a hero who fought to protect his homeland from invasion. In the television series, Buffy the Vampire Slayer (1997–2003), the three faces of Dracula are addressed more directly. Many of the vampires are beautiful and charismatic until they’re ready to feed, at which time, they take on a frightful, demonic aspect. Older vampires—such as the Master in the first season of Buffy—seem directly inspired by Nosferatu. Buffy even met Count Dracula himself in one episode, and yes, he turned out to be Vlad III. Two bald, human-like creatures with pale, almost gray skin made their way through the brush like crabs scuttling across the ocean floor. Their eyes were solid black and bulged slightly glistening in the moonlight like rats’ eyes. He’s about as close as you’re going to come. The way he tells it, he was minding his own business on a piece of real estate in the Carpathians when the Ottoman Turks invaded. He fought with Vlad the Impaler to drive them out of Wallachia and Moldavia. One of the challenges I enjoy as a writer is to mix and match the familiar in order to find new meanings. As shown by the number of times these three faces of Dracula have appeared in books and cinema, each one can be used to reveal new and interesting aspects of a character we thought we knew. It gets even more exciting when we mix and match these ideas and apply them to new characters who are different from the original. Is there another face of Dracula I didn’t cover? I’d love to hear about it. David’s novels, Vampires of the Scarlet Order (2005) and Dragon’s Fall: Rise of the Scarlet Order (2012) are both available through Amazon and Barnes & Noble (Vampires; Dragon’s Fall). See David’s Amazon profile for more of his writings. 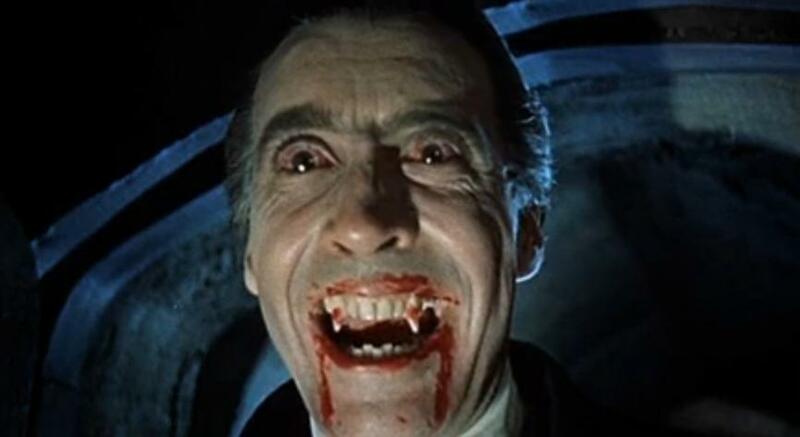 Though commonly associated with Vlad III, Count Dracula’s resemblance is purely superficial, according to famed Dracula scholar, Elizabeth Miller. Read her book, Dracula: Sense & Nonsense (2000; 2006) for more details. David Lee Summers is an author, editor, and astronomer. His novels "Dragon's Fall: Rise of the Scarlet Order" and "Vampires of the Scarlet Order" are available online at Amazon.com and BN.com. I very nice walk through the ages on Dracula. The original ‘Dracula’ by Stoker still remains a favorite, with ‘Sunshine’ by Robin McKinney and ‘The Historian’ by Kostova being close seconds. Dracula has even gone to space in some scifi novels (such as Out of the Dark by David Weber). Not one of my particular favorites, but definitely a fun twist. Thanks! I’ll have to add Robin McKinney’s “Sunshine” and David Weber’s “Out of the Dark” to my reading list. One of my favorite science fiction vampire stories is Colin Wilson’s “The Space Vampires” which was adapted into the film “Lifeforce”. No Dracula that I recall, though.